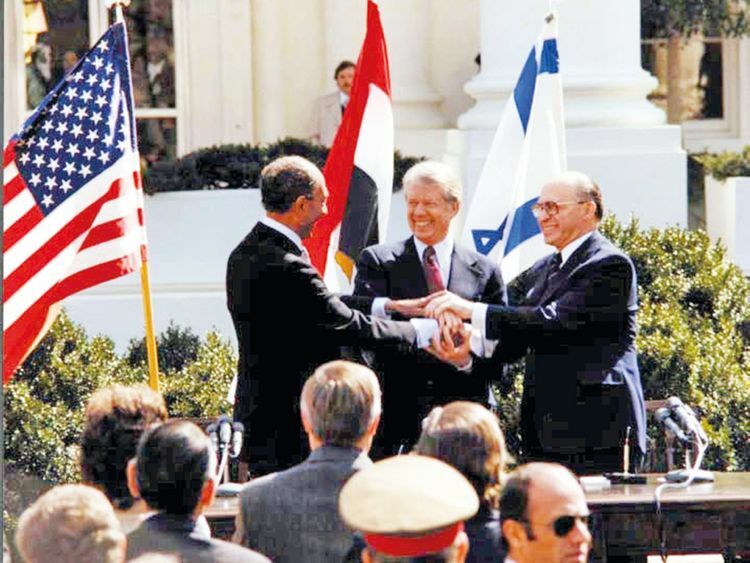 Cairo: The US-mediated 1979 treaty between Egypt and Israel may only have resulted in a “cold peace” but their ties have survived four decades in a turbulent region, analysts say. 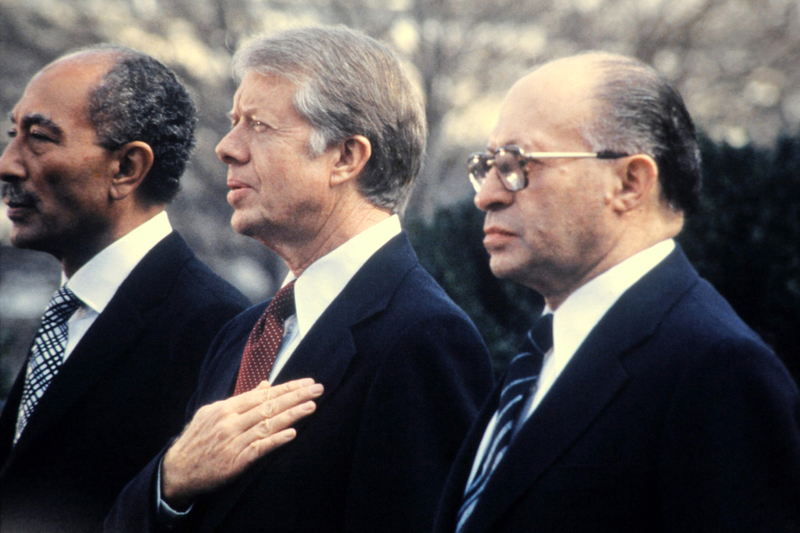 In this file photo taken on March 26, 1979 Egyptian President Anwar al-Sadat (L), US President Jimmy Carter (C) and Israeli Premier Menachem Begin (R) listen to national anthems before signing the historic US-sponsored Mideast peace treaty between Israel and Egypt on the north lawn of the White House. The treaty has emerged unscathed from upheavals in Egypt, notably the 2011 revolution that toppled longtime ruler Hosni Mubarak, proving its “stability”, said Amr Al Shobaki, political analyst with the Ahram Center for Political and Strategic Studies. In 2017, President Donald Trump’s administration recognised the Occupied city of Jerusalem as Israel’s capital, causing uproar in the Muslim world. He followed up on Friday with a pledge to recognise Israel’s annexation of the Golan Heights. Israel seized east Jerusalem, Syria’s Golan and Egypt’s Sinai Peninsula in the 1967 War, when it also occupied the West Bank and Gaza. 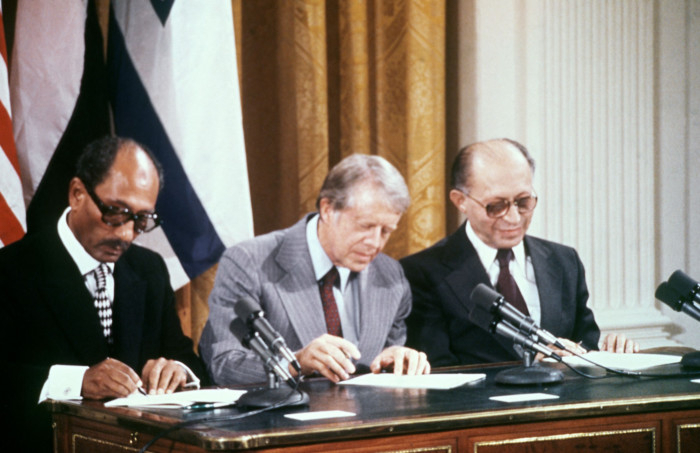 In this file photo taken on September 17, 1978 Egyptian President Anwar al-Sadat (L), Israeli Premier Menachem Begin (R) and US President Jimmy Carter (C) sign a peace agreement in the East Room of the White House. Successive leaders in Cairo have kept the treaty in place even after Egypt’s uprising and the army’s 2013 overthrow of its first democratically-elected president, Islamist leader Mohammad Mursi, who himself did not move to scrap the accord. “In all cases, the peace treaty has remained in place,” Al Shobaki said. Instability since 2011 has thrown into disarray the North Sinai region along the border with Gaza and Israel where a local affiliate of Daesh has spearheaded an insurgency. Political commentator Abdul Azim Hammad pointed to increased security cooperation with Israel, which has agreed to Egypt’s military presence in the Sinai being boosted to fight the terrorists. In an interview with US television network CBS, Egypt’s President Abdul Fattah Al Sissi acknowledged heightened cooperation with the Jewish state. The aid was partially suspended between 2013 and 2015 following Mursi’s ouster, but it was quickly restored. “For the United States, the Egyptian army is a stabilising element in a region bristling with tensions,” Al Shobaki said.